"I'm here to take you to live with your father. In Tokyo, Japan! Happy birthday!" In the Land of the Rising Sun, where high culture meets high kitsch, and fashion and technology are at the forefront of the First World's future, the foreign-born teen elite attend ICS-the International Collegiate School of Tokyo. Their accents are fluid. Their homes are ridiculously posh. Their sports games often involve a (private) plane trip to another country. They miss school because of jet lag and visa issues. When they get in trouble, they seek diplomatic immunity. Enter foster-kid-out-of-water Elle Zoellner, who, on her sixteenth birthday, discovers that her long-lost father, Kenji Takahara, is actually a Japanese hotel mogul and wants her to come live with him. Um, yes, please! Elle jets off first class from Washington, DC, to Tokyo, which seems like a dream come true. Until she meets her enigmatic father, her way-too-fab aunt, and her hyper-critical grandmother, who seems to wish Elle didn't exist. In an effort to please her new family, Elle falls in with the Ex-Brats, a troop of uber-cool international kids who spend money like it's air. But when she starts to crush on a boy named Ryuu, who's frozen out by the Brats and despised by her new family, her already tenuous living situation just might implode. 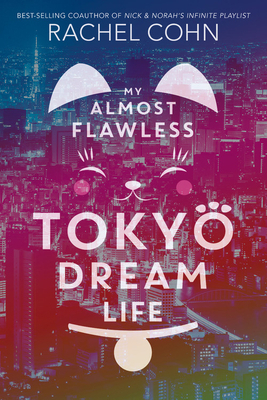 My Almost Flawless Tokyo Dream Life is about learning what it is to be a family, and finding the inner strength to be yourself, even in the most extreme circumstances. Rachel Cohn is the New York Times best-selling author of several young adult novels, including Kill All Happies, Gingerbread, Shrimp, Cupcake, and, with David Levithan, Nick & Norah's Infinite Playlist, Dash & Lily's Book of Dares, and Sam & Ilsa's Last Hurrah. Visit Rachel online at rachelcohn.com or on Twitter @rachelcohn.